MyHeritage, one of the world's most popular family Web sites, today announced a $15 million investment from leading venture capital firms Index Ventures, an investor in Skype, and Accel Partners, an investor in Facebook. With a network of more than 25 million family members worldwide, more than 260 million profiles, and 230 million photos, MyHeritage has become the second largest online destination for families. The company also announced automatic photo tagging technology that will change the way people interact with, store, and share, digital photos. MyHeritage, one of the world's most popular family Web sites, today announced a $15 million investment from leading venture capital firms Index Ventures, an investor in Skype, and Accel Partners, an investor in Facebook. With a network of more than 25 million family members worldwide, more than 260 million profiles, and 230 million photos, MyHeritage has become the second largest online destination for families. The company will be using the investment to expand the team, establish commercial operations in London and continue building upon its history of translating advanced technology into a consumer-friendly service. Index Ventures led the financing, and its partner Saul Klein will join Simon Levene of Accel Partners on the board. This week, the company added a new dimension to the way families stay in touch by launching an innovative photo tagging technology that allows people to catalogue, organize, and search their digital photos more easily. 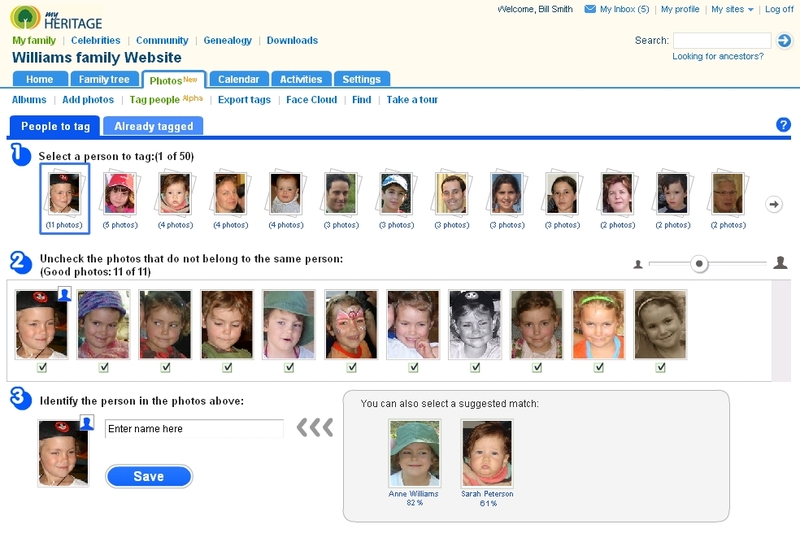 Rather than tagging friends and family one by one, MyHeritage can now recognize faces automatically, group similar ones, and tag the entire group. 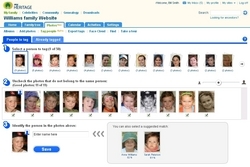 MyHeritage already hosts 230 million photos on its own site, but people with pictures stored on popular online photo sharing applications like Flickr, Google's Picasa, Facebook, Webshots, MySpace, Microsoft Live, Photobucket and Freewebs, can also use the new photo tagging technology. Founded by CEO Gilad Japhet, MyHeritage helps people around the world discover, connect and communicate with their extended family network and easily research their family history. The service is unique in its international reach, currently translated into 25 languages with more to follow. Its impressive growth is based on an increasing desire of families to stay closely connected and learn more about each other. MyHeritage can be accessed through the Web site or by downloading a simple piece of software for free. Gilad Japhet said, "Our goal is to make MyHeritage the number one online destination for families. We've been working hard to create an experience that is fun and easy to use, but based on advanced technology that really sets us apart. With the added expertise of the Index Ventures team, MyHeritage is ready to start realizing its long term vision." 1. Size: more than 25 million members, 260 million profiles in 5 million family trees, and hosting more than 230 million photos. 2. Reach: available in 25 languages today with more coming in the next few weeks, MyHeritage supports more languages than any other genealogy site. >Find relatives: MyHeritage uniquely suggests people you may be related to based on facts like dates, names, and locations, also taking into account language or spelling differences. >Research family history: MyHeritage offers a powerful, easy to use search engine that analyzes more than 1,500 family history sites to help you find information on your family. >Share family photos: MyHeritage now also tags your photos automatically, making them easier to organize, search and share. Index partner Saul Klein said, "We've seen with Skype how much families are starting to embrace the internet to stay in touch. Based on what MyHeritage has been able to do in a short amount of time, we believe it has the potential to become as important to families as Facebook is for friends and LinkedIn is for professional relationships. Now, with the new photo tagging technology, MyHeritage is an even better place for families to stay in touch and share memories." "MyHeritage is a hidden gem in one of the Web's most interesting spaces and the team has accomplished an enormous amount since the site launched and Accel first invested in the Series A," said Simon Levene, partner at Accel. "With almost no marketing and a small, extremely talented team, MyHeritage has quietly become the second largest family destination online and is growing at a staggering rate. The team has developed unique technology that will change the way families stay connected and learn about each other online." MyHeritage was founded by a team of people who combine their passion for family history with the development of innovative technology. It is now one of the world's leading online networks for families, and the second largest family history website. MyHeritage is available in 25 languages and home to more than 25 million family members and 260 million profiles. The company is based in Bnei Atarot, near Tel Aviv, Israel. For more information, visit http://www.myheritage.com. Index Ventures is a leading European venture capital firm active in technology venture investing since 1996. The firm is dedicated to helping top entrepreneurial teams in the Information Technology and Life Science sectors build their companies into market defining global leaders. The firm has offices in Geneva, London and Jersey and focuses on investments from seed through growth stage companies. Recent exits include Skype (the pioneering communications company acquired by eBay); MySQL (the world's most popular open source database recently acquired by Sun), Last.fm (the world's largest social music platform, recently acquired by CBS) and BioXell (BIOX, floated on the SWX in 2007). Founded in 1983 and with offices in Palo Alto, London and China (via the IDG-Accel Partnership), Accel Partners has a long history of excellence and innovation in the venture capital business and is dedicated to partnering with outstanding entrepreneurs and management teams to build world-class technology businesses. Accel portfolio companies have completed IPOs that have created more than $150 billion in market capitalization and the firm has a history of backing category-defining companies which include Admob, Actuate, Agile Software, Alfresco, AMCC, Arrowpoint, ComScore, Facebook, Foundry Networks, GlamMedia, Infinera, JBoss, Kayak, Macromedia, metroPCS, Polycom/PictureTel, QlikTech, Real Networks, Redback Networks, Riverbed, UUNet, Veritas, Walmart.com, XenSource and Zimbra. For more information, visit the Accel Partners web site at http://www.Accel.com.